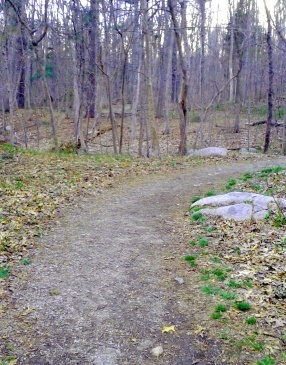 The hiking trails up Turkey Hill are a part of Whitney and Thayer Woods Reservation, a Trustee of the Reservations property. What I like about this hike is it's location. 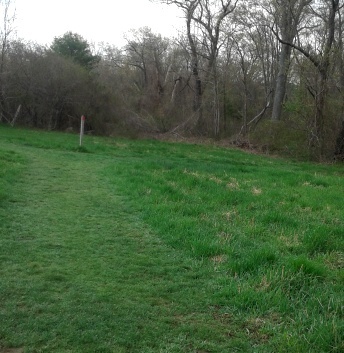 Being a smaller portion, (turkey hill is 62 acres) on the side of a larger property, (Whitney and Thayer Woods are 824 acres) makes this trail one that can be made into many possible hiking trail routes. Meaning it can be a short hike up the hill and back down again, or changed up by adding other areas to make it larger or kept simple and made into a loop. I chose a loop route this particular day. A quick boardwalk leads over to a wide gravel path with an information kiosk at the start of the hike. 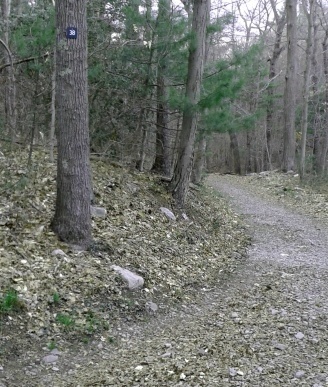 The trail immediately starts with a sweeping turn and shortly comes to an intersection marked by a number 31. 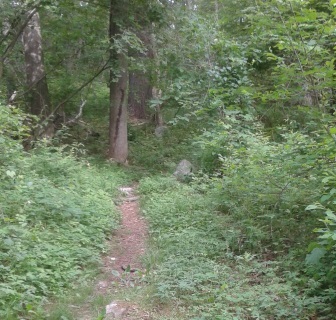 The hiking trail up Turkey Hill leads gently to the right and starts a moderate climb uphill. As you climb the trail there will be a couple of water bars across the trail. Just after the second one there is almost a field of grape vines. At about .13 the trail turns to the right and levels out. 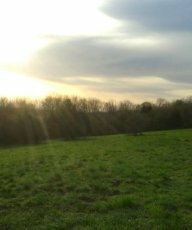 Soon after views of the meadow at the top of the hill will come in sight. Looking carefully to the right a narrow trail will lead off. This makes a side loop and leads to a stick teepee frame. 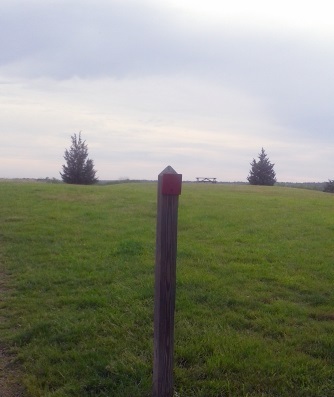 At .19 a post that once held a wire fence marks the entrance to the meadow portion of the trail. 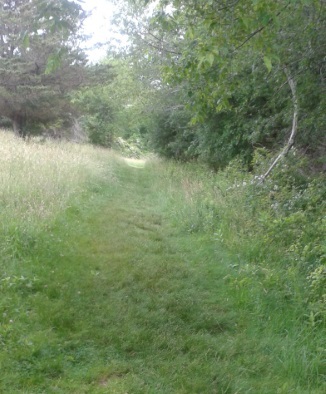 The hiking trails from this portion of the hike are mowed grass trails. 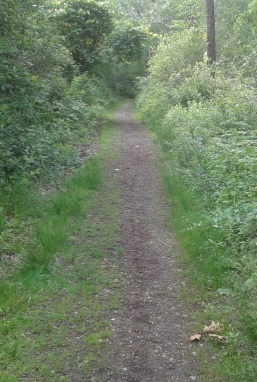 My journey continued straight across the lower meadow. 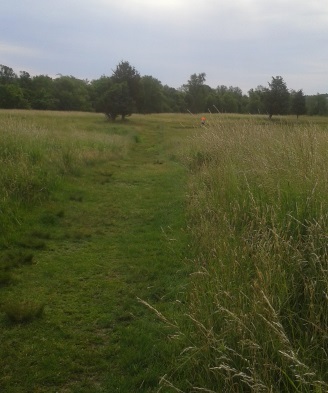 The trail to the left leads straight uphill to the upper meadow portion where one will find a loop trail around the upper meadow area which in itself is approximately 1/2 mile loop. Continuing straight across the lower meadow trail, at .25 the trail starts winding and begins to climb a bit. At .31 it meets the lower loop trail of the meadow loop trail. 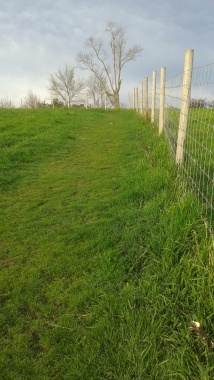 I continue straight and soon after find a picnic bench at the top of the hill. From here there are limited views of a faraway ocean in Hull. lot is located on Turkey Hill Lane in Hingham. 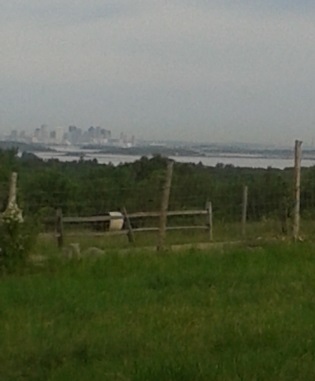 Here I can see portions of the Blue Hills Reservation, parts of Boston and the Harbor with it's islands. 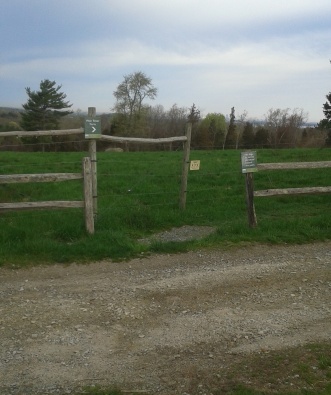 Across the parking lot is the trail to the Weir River Farm. A larger hike could be made by continuing on the trail to Weir River Farm across from the parking lot, but I have limited time today. There are two more options for making a loop hiking trail here. 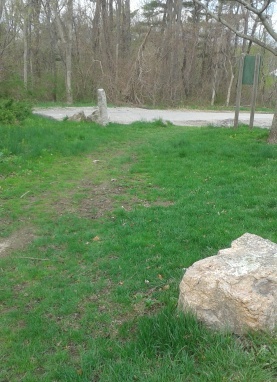 The paved portion of Turkey Hill Lane ends at a green gate. 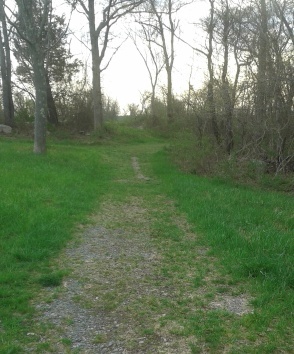 It continues on the property as a dirt road leading to a wide path in the wooded area of Whitney Woods along the side of the meadow. want to explore on a bicycle. Access is best from the Weir River Woods parking area. 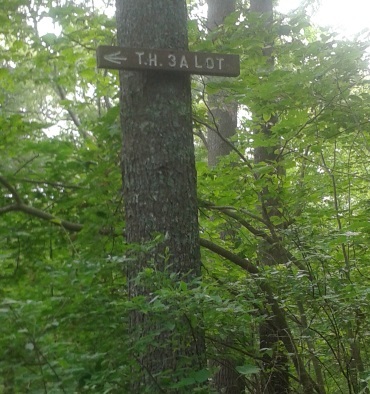 ( The trail from Turkey Hill parking lot is not suitable, nor are bicycles permitted on that route). the meadow a bit, follow back to the meadow loop trail. Heading back into the meadow on the right, the upper meadow loop with red markers leads to the right and past a building that seems to currently be a bird nesting area. The trustees web site says it's the remains of an anti-missile radar control station sited here during the Cold War. 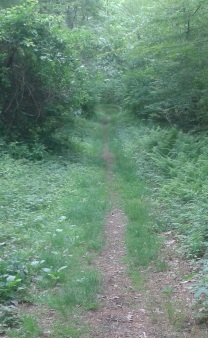 of the trail that dissects the meadow loop. I found wild strawberries in the field. 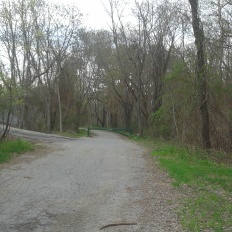 portion of Turkey Hill Lane that runs parallel with the meadow trail. square and our journey turns right. at .54 miles of our journey. 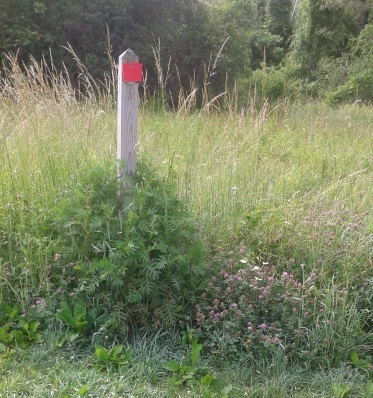 If at the point of this hike, you decide on a smaller journey, you can continue on the loop around the meadow. 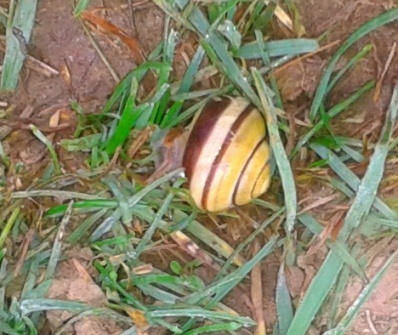 Hiking this loop another day I found a brightly colored snail on the trail in the grass! One never knows what you will find hiking the south shore hiking trails! The trail will wind downhill a slight bit and meet the trail that leads back down to the meadow entrance and follow the original gravel trail back down to the parking lot which will finish at 1.25 mile hike at 30-45 minutes. with the hiking trail becoming increasingly rocky. Shortly at .73 there will be an intersection marked by a number 38 and white square trail leading to the right. Our route turns slightly to the left and continues downhill. At the bottom of the hill at .77 miles is another intersection marked by the number 15. Here the red square hiking trail goes straight and connects shortly with the newly renovated Whitney Spur Rail Trail. 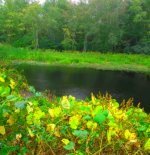 This trail is good for accessing Wompatuck State Park. continues on Side Hill Rd. having done so, in Cohasset. back to the parking lot on rt. 3A. It is also marked as intersection #30.
it leads along small and winding. on the right, then heads downhill a bit. At .95 a cement wall with a fence above it appears on the left. 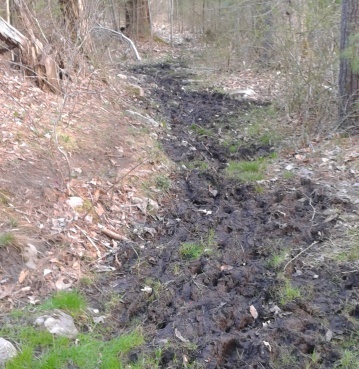 The trail turns left and leads through two areas of muddy patches along a small marsh area to the right. Ruts made deep from bicycle use in this area show one reason why this mode of travel is prohibited on small trails like these. 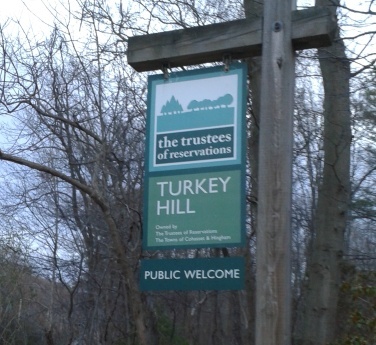 There is a sign prohibiting bikes from the Turkey Hill trail, but not from the Side Hill Rd. side of this connector trail. The trail shortly thereafter climbs uphill once again.. It levels out and crosses the entrance road to the Harbor View Nursing Home at 1.03 miles. Shortly after it comes upon the original intersection marked 31 at 1.11 miles and leads then back to the parking lot. Total for this loop hike of Turkey Hill is 1.15 miles. from exit 14 off route 3 follow rt. 228 north into Hingham til it's intersection with route 3A. Take a right on 3A and approx. 1/2 mile on the right is the Turkey Hill parking lot. Moderate: loop trail uses lots of hills and rocky. 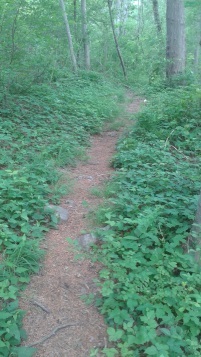 small stream on access trail to the parking lot. bird watching; the meadow atop the hill is maintained in a way to attract grassland bird species. 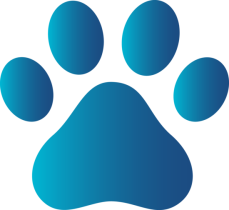 Dogs are welcome on Turkey Hill! 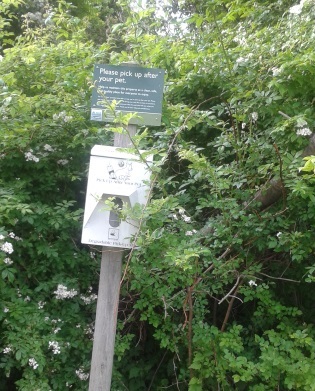 Dogs and their owners will get good exercise here!